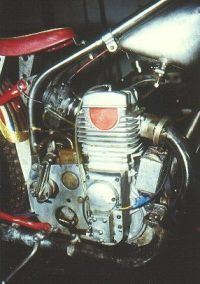 Paolo Bellini built many interesting and often quite beautiful speedway engines in the 1970s and beyond. Marco Bellini, his son, raced successfully on Italian speedway tracks using Bellini engines which included a 1998/99 model which was fitted with a much modified Bordi-designed Ducati 851 twin-cam desmo head. 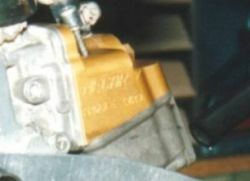 It all started around 1978, as Paolo Bellini and Walter Kruger (a German Porsche mechanic living in Italy) decided to built a special speedway-engine by using a Weslake OHV bottom half, and on top, a SOHC 2V Porsche head. The camshaft on this special engine (Type T152) was driven by a normal roller chain. 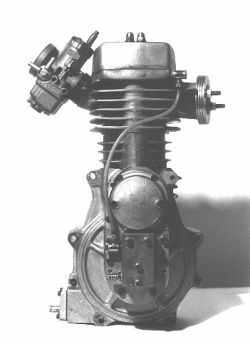 The next engine with type T154 was again made from a Weslake OHV 4 V engine, but on this one, Bellini made a new cylinder and a new 4V head both from a solid piece of alloy. In 1981/82 Bellini started to built his own engine, the type T254 and parts like the crankcase, cylinder, head, rocker covers etc: are all castings. This engine was followed by the type T354 (the one depicted in the photo) and again some new ideas can be found on this interesting engine. On many speedway-engines the mainshaft bearings are roller bearings, but not in a Bellini T354. In this engine the mainshaft are running in very special high performance ball bearings. On the old T254 engine you will find a normal total loss oiling system, but on the T354 Bellini installed an oil recirculation system fed by a new home built oil pump, the oil used being 20W/40 or synthetic oil 15/50. Ignition is by an electronic box, whilst the power of the T354 is a very impressive 63.5 bhp @ 8600 rpm, running at maximum Revs of 11.000 rpm. Below are some coloured photographs of the latest type of Bellini engine that were again sent in by Ben Ludolphy. As you most likely know, all modern engines are either SOHC or DOHC systems for operating the (almost standard) 4 Valves. 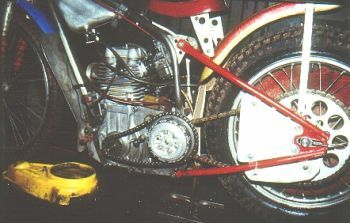 Pushrod engines are very rare in modern speedway or longtrack racing. 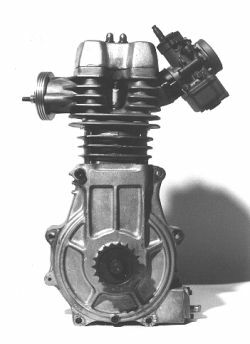 therefore Paolo Bellini decided to build a SOHC 4Valve engine as well. He did this very simple by using a GM SOHC 4 Valve head, and then mounting a roller chain for the cam drive. 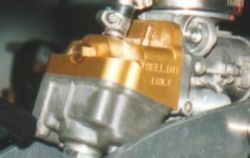 Another project from Paolo Bellini was in the making of modified Dell'Orto carbs with new float chambers for the purpose of horizontally mounted carbs. And further still, he also makes clutches and layshafts weighing only 2.3 kg.